ONE THING THAT LEADS TO ANOTHER!!!!! I have been learning how to make bentwood rings. They are not easy. So I made my first plain ring, then did one with two different woods, then one with an inlay. Now I wanted to make one using a stainless steel ring as the base. 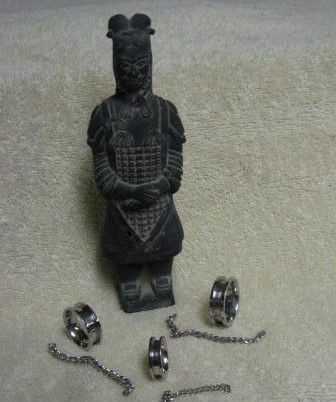 It was very hard, for me, to find the SS ring blank with out shelling out an arm and a leg. I was given the name of bikerjewerly.com as a possible source. I called Steve (owner) to tell him what I wanted to do and he sent me some rings. The rings had a chain in the groove that I was able to remove by cutting. After all, this came from a biker jewelry store. One of the problems I have had with making the other rings was not having enough hands. So this is the ONE THING THAT LEADS TO ANOTHER – a ring vise! To wrap the wood in the groove I had to be able to push down on the wood with out becoming a part of the ring from the super glue. I shaped a piece of oak as show in picture #3. It fits over a headless hanger screws and held down by a wing nut. The hole is wobbled out to allow the vice part to tilt. (Wobble is a wood working process that takes many years to master.) It works amazingly well. A quick turn to loosen or to tighten is all it takes. The tape is to keep the superglue off the ring, but on the next one I believe that I will rub wax on those areas instead of the tape. The wood for the ring is fumed eucalyptus. This is the normal color of eucalyptus. The fuming process gives the wood a brownish/black to dark black finish. 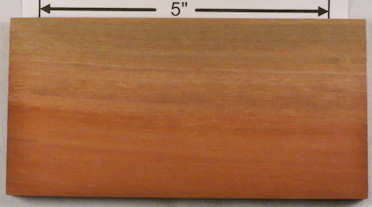 It did not change color during steaming of the wood. I have not put a finish on it other than doing a high speed polish of the super glue. Looking for suggestion for this part. I am very pleased with the results of my first try to make this type of bentwood ring and more pleased with making the ring vise. I did all of the sanding and polishing on my sewing machine lathe that I posted a while back. Nice. I wouldlike to try this also and you gave me some idea’s. I do the same with super glue and use pastewax to polish.I also found out on this site that wax paper works good under ring to keep glue from sticking.